The Courtyard by Marriott in Evansville, Indiana, uses seven Navien NPE-240’s to provide a steady supply of hot water for high and low demand. The Courtyard by Marriott has to supply hot water on demand to 119 rooms as well as a laundry facility and a small restaurant. Demand varies greatly depending on the number of guests and restaurant traffic, so the hotel needed a system to provide the flexibility of handling peak loads and off times. Design engineer Scott Reed from Evansville Winnelson, the Navien distributor, designed a hot water supply system with seven Navien NPE-240 water heaters and three unheated tanks to circulate water to and from the Navien heaters. 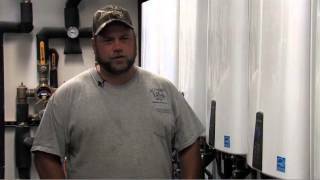 Joe Cox from Altstadt Plumbing worked with Scott to plan and install the system. The entire installation took less than two weeks. Easier venting installation: “On this installation we used schedule 40 PVC solid core for intake and CPVC schedule 80 for exhaust,” Joe said.